Perfect accent for any sea farer. The Sail Away Compass pillow features an embroidered compass on a quilted background surrounded by navy, and bordered with a corded trim. Zipper on the reverse side for easy removal. 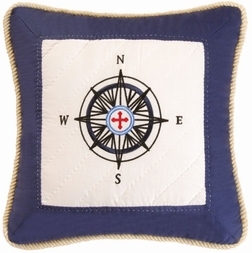 Display on your sofa, on your boat, or in your bunk! Meausures 16 x 16 in.